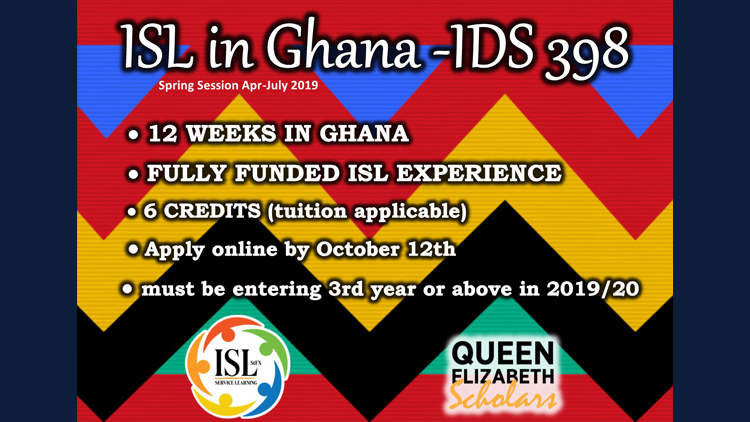 Applications have now opened for the fully funded Immersion Service Learning (ISL) in Ghana student experience, a 12-week, in-country experience offered in conjunction with the six-credit course, IDS 398. This student experience is fully funded by The Queen Elizabeth II Diamond Jubilee Scholarships program. Students only pay course tuition. Students must be entering third year or above in 2019-20 to apply. Application deadline is Oct. 12, 2018. IDS 398 and Service Learning in Ghana bring together experiential learning in community-based contexts in Ghana with academic course work to deepen students' understanding of the dynamics of local change in contemporary Ghana as it relates to issues of global inequality and social justice. Through service learning experiences in community-based partner organizations and ongoing critical reflection, students blend theory with practice for a complex understanding of community development in rural Ghana today. This course is designed to complement learning in a wide variety of academic areas. Through community placements, students can focus on elements of the course that connect with their particular disciplinary interests. QEScholars join a community of young global leaders across Canada and around the world to create lasting impacts both at home and abroad through cross-cultural exchanges encompassing international education, discovery and inquiry, and professional experiences. For more information and to apply, please visit here. To learn more about the Queen Elizabeth II Diamond Jubilee Scholarships program, please see here.